We designed this new, next generation, 5-axis vertical machining center to manufacture high-precision parts. It delivers impressive metal removal rates in a compact design. Its solid double-column structure, full 5-axis simultaneous control, and thermal stability performance give it the ability to easily cut a variety of materials. This machine dispels every 5-axis machining myth. Often we hear hesitations like "5-axis machining is too complex and costly." Or, there are concerns about positional inaccuracies, software, and employee training. There are a lot of myths out there around 5-axis machining and this machine is here to dispel every one of them. Long time Okuma customers have been requesting a full simultaneous 5-axis machine at an affordable price point. And at Okuma, we listen. The Okuma GENOS M460V-5AX is perfect for shops that want to take an initial step into 5-axis machining. But it's also great for those looking for a reliable and affordable 5-axis machine. The impact of 5-axis is dramatic, and we've seen shops that have been able to substantially grow after adding this capability. These days, 5-axis is not a luxury, it's a must-have. 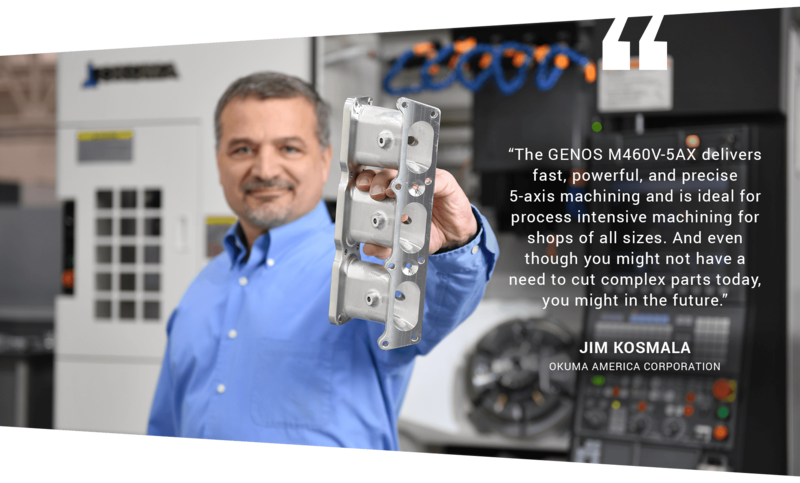 The GENOS M460V-5AX is a game changer for shops small and large alike. GET YOUR CUSTOM QUOTE ON THE GENOS M460V-5AX TODAY!